묘법연화경은 줄여서 ‘법화경’이라고 부르기도 하며, 부처가 되는 길이 누구에게나 열려 있다는 것을 기본사상으로 하고 있다. 묘법연화경은 천태종의 근본경전으로 화엄종과 함께 우리나라 불교사상 확립에 크게 영향을 끼쳤다. 감지금니묘법연화경 권3~4(紺紙金泥妙法蓮華經 卷三~四)은 법화경의 내용을 청색 종이에 금색 글씨로 옮겨 쓴 것으로 권3과 권4 2책이 전해진다. 병풍처럼 펼쳐서 볼 수 있는 형태로 되어있으며, 접었을 때의 크기는 세로 31㎝, 가로 11㎝이다. 책 겉표지는 권3·4의 문양이 약간 다르지만 공통적으로 책 제목이 있고, 그 주위에 화려한 꽃무늬가 장식되어 있다. 다른 권은 없어지고 이 책만 남아서 책을 펴내게 된 경위와 만들어진 정확한 연대를 알 수 없으며, 다만 권3 끝에 ‘施主權圖南(시주권도남)’이라고만 씌여 있다. 글자를 매우 유려하게 정성들여 썼고 금색도 선명히 남아 있는 고려 후기에 펴낸 책으로 추정된다. Myobeopyeonhwagyeong (Saddharmapundarika Sutra), called Beophwagyeong for short, is the basic sutra of Cheontae Order, one of the Korean Buddhist sects. Its basic idea is that everyone can be Buddha. Together with Hwaeomgyeong (Avatamsaka Sutra), Myobeopyeonhwagyeong had a vast influence on the establishment of Korean Buddhism as the best seller among the Korean Buddhist sutras. 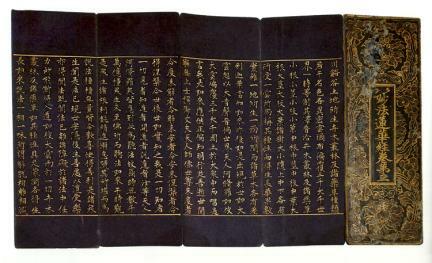 Volumes 3 and 4 were written in gold letters on indigo paper, copying the sutra and then decorating it. They are foldable, and when folded, it is 31 cm long and 11 cm wide. The patterns on the cover page of volumes 3 and 4 are a little different, but both have its title in common on the cover and follow the standard of sagyeong, copying the sutra and then decorating it with flower designs. The purpose and the exact year of the book are hard to discover for the other volumes are missing, but judging by its dedication and fine penmanship, it was probably written in the late Goryeo Dynasty (918-1329).